I hate Boston. No, it’s not because I’m a New Yorker who roots against the Celtics or Red Sox. (I have no particular affection for the Knicks, and I loathe the Yankees above all else.) It’s because I’m a snow lover and easily envious. Boston crushed New York City on its way to a seasonal snowfall record this year. 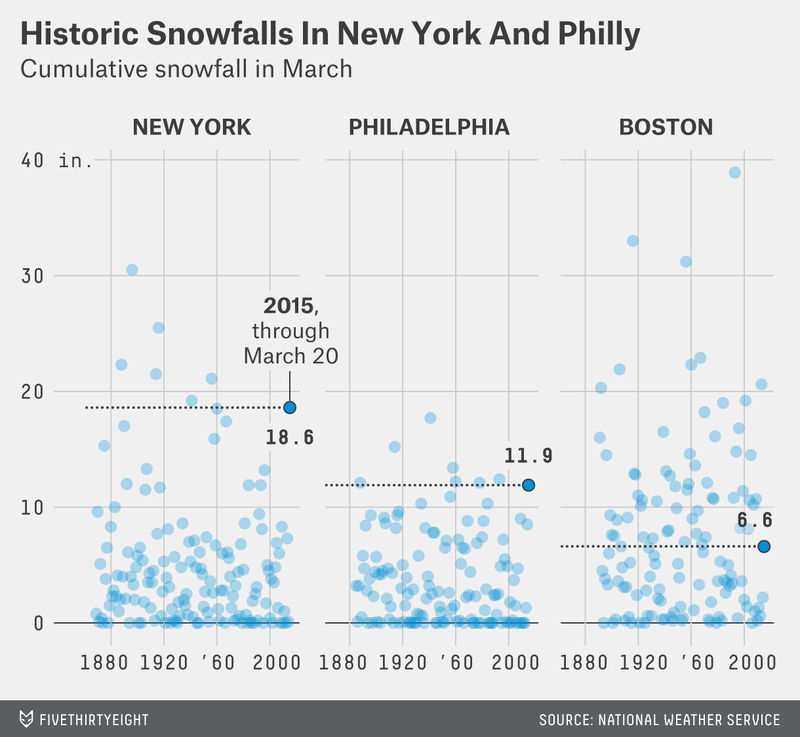 But while Boston may have won the snow war, New York (and Philadelphia) is winning the battle of March. In fact, the two cities are enjoying1 historic March snows. Travel south on I-95 to Philadelphia, and you’ll find the same story. Friday brought an impressive 3.9 inches to Philly, which has averaged just 3.6 inches in all of March each year since records were first kept in 1885. Philly has gotten 11.9 inches of snow this month — the eighth-highest March total over the past 131 years. Meanwhile, Boston’s March has been ordinary. Yes, Beantown broke its seasonal record a week ago, but only 6.6 inches has fallen for the month. That’s less than the average of 7.4 inches since 1891, a foot less than New York has received this March, and more than five inches less than Philadelphia has had. To put that in some context, Boston averages nearly three inches more than New York and four more than Philadelphia in March. Will Boston stay behind its southern brothers for the rest of March? It’s unclear. What we do know is that all three cities will continue to have a heightened chance of snow for this time of year. The Climate Prediction Center’s eight-to-14 day outlook shows an above average chance of both cold air and precipitation for all three cities. Well, I’m enjoying it at least. We measure snow in a different way than we used to, but that doesn’t explain the snowiness of this March. The 30-year average for snow is less than the 148-year average.